We often get asked by customers if you can dry clean a rug. However, it’s not a simple yes or no answer. The experts at Woods Rug Laundry would like you to join us as we discuss when you can, and when you can’t, get your rug dry cleaned. What is the difference between rug cleaning and rug dry cleaning? Both methods of cleaning a rug can achieve amazing results. The difference lies in how much water is used to clean your rug. Ultimately, the success of the cleaning relies on the skill, equipment and cleaning products used by the professional cleaner in question. Rug cleaning when done by professionals like Woods Rug Laundry follow a seven-step process. Firstly we inspect the rug to see what has caused the dirt, stain or damage. One we’ve assessed the cause, we can work out the best course of action for the rug cleaning process. It also means we can give you an idea of how successful the cleaning process will be – don’t forget that some stains, like pet urine, can’t always be removed. We then go through a process to remove dust and dirt from your rug. This is an important step to ensure that the dirt and dust doesn’t turn into mud when it is washed. Rugs can hold kilograms of dirt and you don’t want that mixing with water! Rugs are then pre-treated with specially developed solutions that are water-based, bio-degradable and as close to ph-neutral as possible. The rug is then washed in a rotary machine that gently massages shampoo through the rug fibres. It is then put through a specialised wringer to ensure all water is removed from the rug. The rug is then placed in our drying room to dry and dehumidify before it passes through a final inspection, vacuumed, and groomed, and then it is delivered back to you. Rug dry cleaning can be successful if your rug is only lightly soiled or marked. However, you must always take your rug to a dry cleaner who has a proven track record, and proven experience, cleaning rugs. You cannot take your rug down to any local dry cleaner. If your rug is more than a little marked, dirty, or soiled, it is best to bring your rug to a professional rug cleaning service instead. Unfortunately, there are rug cleaning and rug dry cleaning services out there that can do more damage to your rug than good. It is never a good idea to have your rug cleaned or dry cleaned in your home. Too often we have new clients coming in with rugs that smell – even weeks after the home cleaning service – or already have signs of mould or mould damage. This means they either face an expensive cleaning bill to repair the damage, or having to replace their rug entirely. This is because most – if not all – homes are just not equipped to effectively clean and dry your rug. Rugs must be completely wrung dry to prevent water damage to rugs. This involves carefully made drying rooms that ensure all moisture is removed. Most in-home services will simply leave your rug on the floor where it was cleaned, essentially soaking in its own water. This leads to rotting and dangerous mould that can affect the health of you and your family, as well as destroying your rug. Whether you choose to have your rug cleaned or dry cleaned, it is important to take your rug to professionals who have the facilities to properly clean and dry your rug. There are several things you can do at home to keep your rug looking pristine after cleaning. Vacuum often to remove the grit that can wear down your rug fibres. 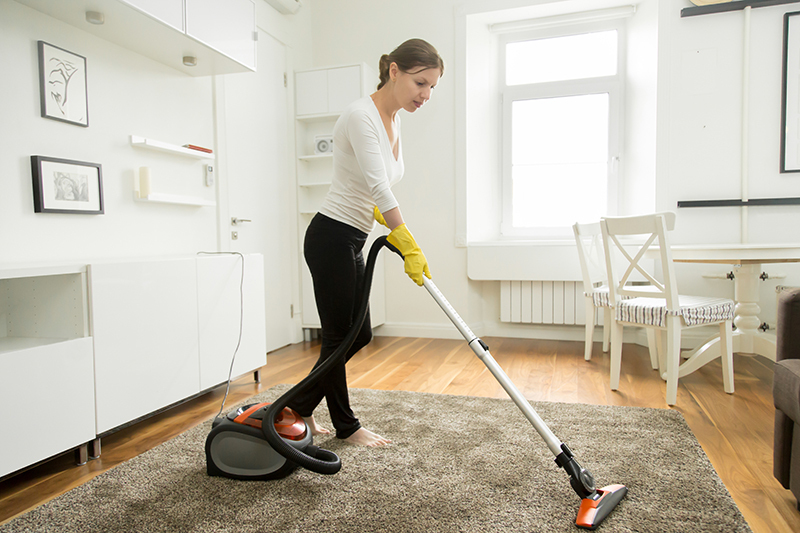 It is important to choose a vacuum that can deep clean and remove the most dirt possible. Always remember to vacuum the top and back of your rug to get the most dirt removed as possible. Rotate your rugs, especially those in high traffic areas or that sit under a table. By rotating your rugs as much as possible can avoid your rug forming worn spots. A quality rug underlay will also provide a protective layer between your rug and the floor to stop rubbing damage on the backing of the rug – and help prevent slipping accidents! If your rug becomes stained, don’t use off-the-shelf products! Blot the excess liquid as best you can. Then book your rug in to be professionally cleaned as soon as possible! Off-the-shelf products can damage the colours and fibres in your rugs irreparably. If you need your rug cleaned, contact Woods today to find out about our rug cleaning services!